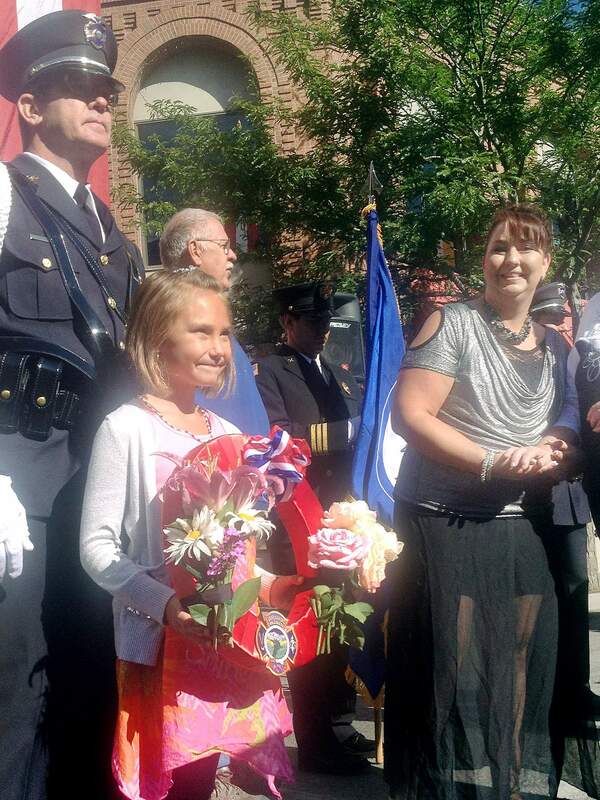 Nicki Nicole Parks watches as her daughter, Jordyn, receives a wreath from Durango Police Detective Brad Roach in honor of her grandfather’s service to the community. Nick Parks III and Gale Emerson died while fighting the Main Avenue fire Aug. 24, 1974. A large crowd gathered in the 800 block of Main Avenue in Durango on Sunday, paying respects to two men who perished in a fire that nearly destroyed the entire block on the same date, Aug. 24, 1974. Durango Police Cpl. Gale Emerson and Durango firefighter Nick Parks III both died in the line of duty fighting the fire that raged through several businesses in what now is the Main Mall. Both were 24 four years old and about to become fathers. The fire, later determined to be arson committed by Gilbert F. Martinez, caused $2 million in damages and wasn’t extinguished for another 24 hours after the initial calls came in the early-morning hours. On Sunday morning, with police and fire officials in formal dress, a pipe band with bagpipes played and a procession ensued. From two standing engine ladders hung a large American flag before the Main Mall – in front of it stood a podium. An account of the tragedy was read. Two other fatal fires in Durango, one in 1954 and one in 1918, were noted. In all, four men have died while fighting fires in Durango. In an intimate address to community members, Nicki Nicole Parks said she never knew her father, being born 53 days after the fire, but the stories and memories shared by others, have now become hers. Over her lifetime, Parks learned of her father’s mischievous smile. His pranks at the firehouse. That he once gave his mother a snake for her birthday, and that he even wrestled a bear on Main Avenue. She told the audience, standing under the flag at the scene of the blaze, that she was grateful. Durango Fire Protection District Battalion Chief Mike Krupa called the day one to remember. Art Rieke was on the scene for Animas Fire Protection that August morning. They were called in as mutual aid after the explosion that killed Parks and Emerson. On the way to Sunday’s memorial, he said he struggled with emotion. “It just brings back memories,” Rieke said. He battled the flames from the roof where Brown’s Shoe Fit Co. is now located. The flames stopped them from entering the Metropole Hotel toward the northern end of the block. Rieke said afterward, he went to see his mother who was working at the nearby Holiday Inn. All she could do was hug him and cry. Then, he described an unbreakable bond. “You can go anywhere in the world, and you’re part of a family,” he said. Parks told one more story about her father. She said just before the fire, he changed his mind, saying instead of wanting a boy, he wanted a girl. The baby his wife, Loretta, and he were expecting turned out later to be a girl. He wanted to name her Nicki Nicole. Parks said she still smiles when people ask why she has two first names. “I’m very proud of my name, and I’m honored to call him ‘daddy,’” she said. A three-gun salute honored the fallen men. The words echoed downtown: Nick Parks. Gale Emerson.